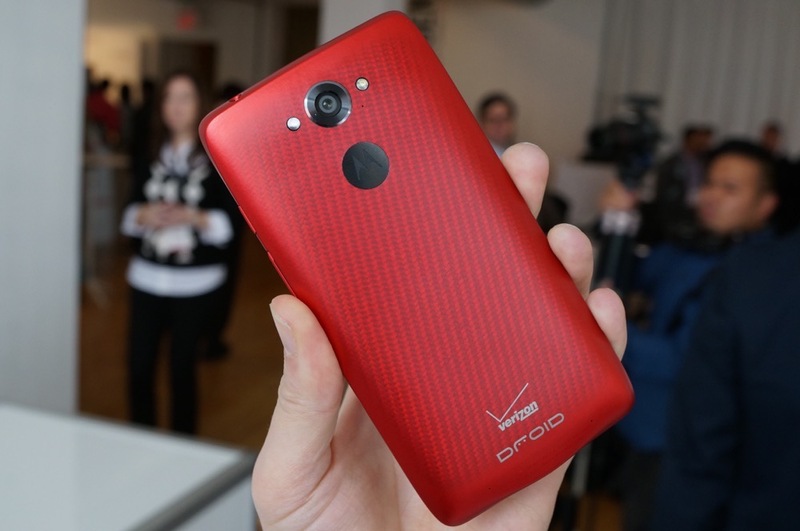 The original DROID Turbo – yep, that one! – started receiving its update to Android 6.0.1 Marshmallow over the weekend. Again, this is the original Turbo, which is a solid 2 years old at this point, still receiving updates, even if they do seem months behind. The update includes WiFi Calling, access to Google Now on Tap (hah! ), Doze (my lord this update is old), etc. 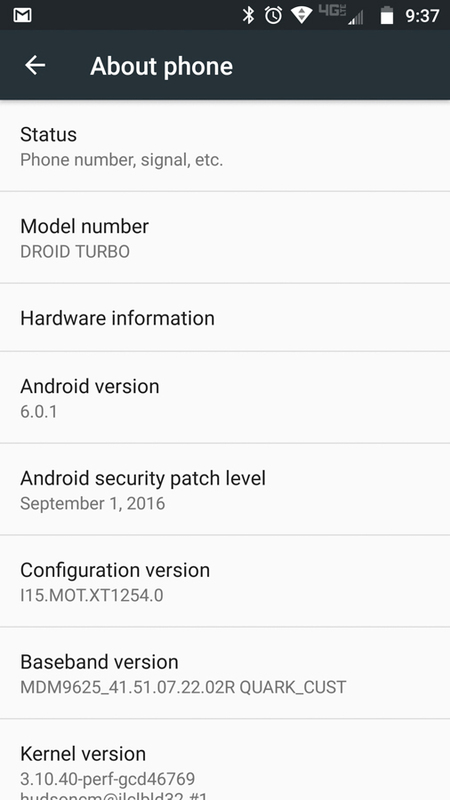 It is indeed Android 6.0.1 with software version 24.81.5 and September’s security patch. September – how long has this update been sitting in a back room collecting dust? It’s December already, Moto. As of now, most Turbo owners receiving the update are a part of Motorola’s soak test program. However, I do believe that a few non-soak testers have also seen the update. 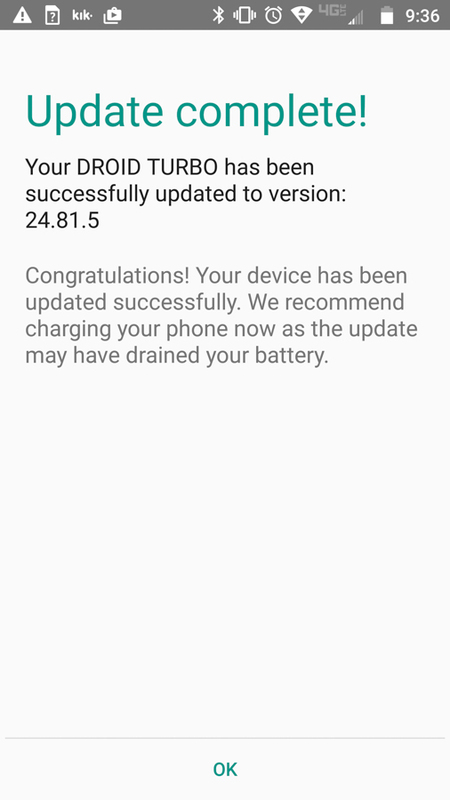 Verizon hasn’t updated their support pages for the phone, so my guess is that this update isn’t quite rolling out to all, but should be shortly. On a related note, a handful (at least 4 people) of Turbo owners have reported that the update hasn’t gone well and that their phones are now bricked. I’ve peaked at some forum threads and still can’t tell if the issue is widespread or not. With a 2-year old phone, who knows how many of these are even in the wild. Either way, be on the lookout, OG Turbo owners. 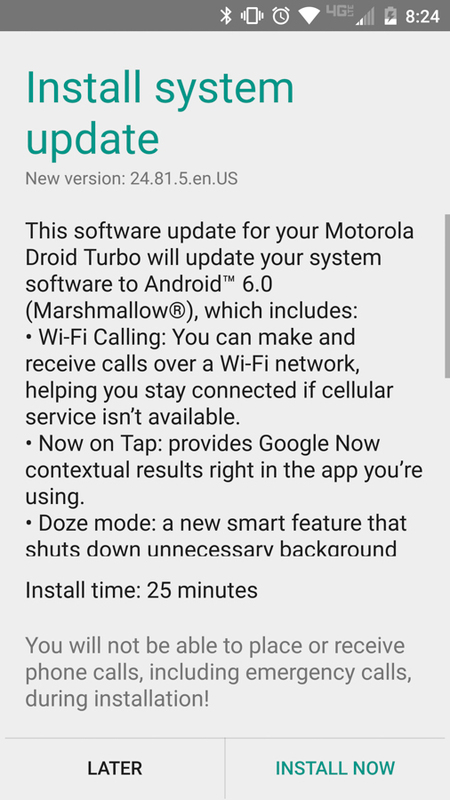 UPDATE: The full details of the Marshmallow update for the Turbo have been posted. You can view them at Verizon’s site. Cheers J, T, and K!